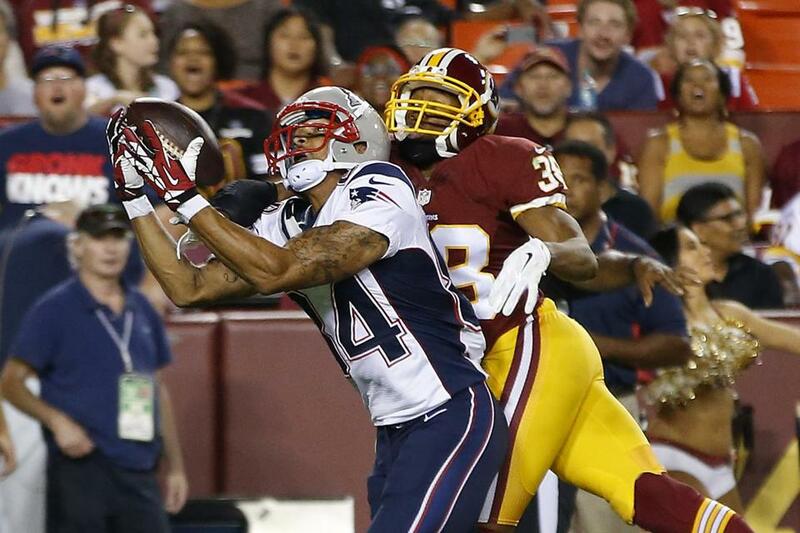 Brian Tyms had five catches for 119 yards against the Redskins last week. FOXBOROUGH — Hopefully, Bill Belichick can forgive Brian Tyms for staring. Tyms, fighting for a roster spot as one of 11 receivers in Patriots camp, admitted he was a little awestruck during Sunday’s practice. He couldn’t believe that after everything he’s been through in 25 tumultuous years, there he was, standing on the field with a Patriot logo on his helmet, catching passes from Tom Brady. If anyone deserves to have a moment to appreciate his opportunity and take it all in, it’s Tyms. Most Patriots fans had never heard of Tyms before he turned in a dominant performance last Thursday night against Washington, catching all five passes thrown his way for 119 yards and a touchdown. He should have had six catches for 157 yards and two touchdowns, but the officials wrongly called incomplete his juggling circus catch in the end zone, though it did draw a pass interference call. Tyms has been an obvious standout at camp since signing July 27. Despite starting four days behind his teammates, Tyms has clearly made the most plays among the receivers vying for a final roster spot. He has shown exceptional hands and body control to outmaneuver cornerbacks and haul in deep passes, and kept it going in last week’s preseason opener. Tyms’s road to New England has been long and winding, to say the least. He is trying to find a permanent NFL home after bouncing around among four teams over the last two-plus years, but that’s nothing compared with the nomadic life he lived as a child. Tyms spent his early years in the Seattle area, but at 12 was taken from his abusive parents and moved to Fort Lauderdale, where he bounced around between group homes and foster homes. Tyms admits he was an angry, frustrated child, but sports were his outlet. He eventually shined in basketball and football at Dillard High. Tyms didn’t get any scholarship offers out of high school, but did whatever it took to keep the dream alive, working at a McDonald’s and living out of the back seat of his car. If he was lucky, a friend would offer him a couch to crash on for a night or a couple of weeks. Tyms finally caught on at a couple of community colleges before getting a scholarship offer to Florida A&M for his final two seasons. He caught 38 passes for 538 yards and three touchdowns as a senior, and earned an invitation to 49ers camp in 2012, where he learned under the wing of former Patriot great Randy Moss. Tyms’s athleticism and potential keep getting him opportunities, but he has been held back by his attitude and lack of experience. He got cut by the 49ers, but was picked up by Miami, where he spent the entire 2012 season and part of 2013 on the practice squad. Last October, the Browns plucked Tyms from the Dolphins’ practice squad and put him on their active roster for seven games. He even suited up in the Browns’ 27-26 loss to the Patriots in December, and finished the season with his first two NFL catches. His Cleveland tenure hit a snag, though, when general manager Michael Lombardi and the rest of the football operations staff were fired in January. The Browns’ new brain trust cut bait with Tyms in February after he tested positive for a banned substance, earning him a four-game suspension to start this season. Tyms’s agent said in a press release that the receiver tested positive for Adderall. Tyms said Sunday that he has had a prescription for Adderall and Ritalin since he was 9 but forgot to clear it with the NFL. Even though he has subsequently been approved for an Adderall exception, he still has to serve his suspension this fall, assuming he makes the Patriots or any other team. Tyms said being unemployed for five months this year was “a very upset time,” but he didn’t pout about his punishment. Matt Gates, a trainer for several NFL players in Fort Lauderdale, said Tyms didn’t miss a day of training over the five months, as Tyms worked out with his mentor, Bears receiver Brandon Marshall, to get one last shot at the NFL and provide for his fiancée and two young children, now ages 3 and 7 months. There’s reason to think that sunnier days are ahead. Tyms has a believer in Lombardi, who landed in the Patriots front office after leaving Cleveland. And the four-game suspension might actually help Tyms; the Patriots now have little reason not to keep him around once roster cuts are made at the end of this month. Tyms won’t count against the 53-man roster limit for the first four weeks of the season, and although he can’t practice with his teammates, it’s not inconceivable that he would have a roster spot waiting for him when he gets back, depending on the health of injured receiver Aaron Dobson or any of the other top guys. He also still has practice squad eligibility. Tyms’s measurables and performance thus far, combined with the Patriots’ deficiencies at receiver, make him one of the more intriguing prospects in camp. “He’s more of a possession receiver, but he definitely has talent,” a Dolphins front office source said. Tyms, though, isn’t counting on anything. He has bounced around enough in life to know that nothing is guaranteed. He just wants to provide for his family and treat this opportunity with the Patriots as if it were his last. “I’m really hard on myself with studying, because I think about my past all the time. I carry my notebook with me everywhere I go.